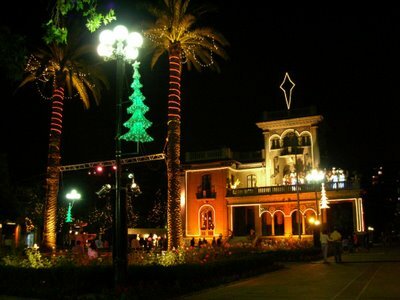 Today, walking on the Pedro de Valdivia Avenue, I saw the beautiful Christmas decorations of the Falabella Palace, which houses the Providencia district's Town Hall. There were many people enjoying the evening in the square and the nice chorus of angels on the second floor terrace. Let me try this again. Thank you so much, Edulabbe, for the pointers about the view behind you. It is so majestic, I will definitely have to come over to Chile! (Easy, head east, go to Blenheim, hit water, continue east. When I hit land, ask an friendly Chilean for further directions!) I hope you're having a good weekend. superbe photo, illuminations et lumieres tres belles. Very nice. It is fun to see similar celebrations around the world. I love when the cities decorate their buildings. Very lovely and an excellent night shot. Thanks for your nice comments on my blog. To answer your question, the flower pictures are all from the Conservatory. Someday I will put up some more of them. The tropical plants are so beautiful. Toda familia de Providencia visita la municipalidad de providencia, para maravillarse con sus luces y relajarse mientras sus hijos se divierten. Aunque ya no vivimos en Providencia, todos los años lo visitamos y compramos palomitas.